This day, Thursday, might be the most difficult day to write a blog post on. At least for me it is… My name is Dirk and I am a third year International Relations student. Today, I did not only encounter ethnic tensions and intense perspectives on reality as I have never encountered them before, I was also confronted with myself and my own perceptions. After today, I will never look at the topics I study in conflict studies the same way. While still struggling to give the experiences of today a place in my head, I will try to give an impression. Our first stop was close to Pristina at the “Field of Blackbirds”, where the famous Battle of Kosovo took place in 1389. A monumental tower on a hill reminds of the Serbian heroism that halted the Ottoman advance further into the Balkans. Traveling through the beautiful landscape of Kosovo, we eventually arrived in North Mitrovica. In Mitrovica, the still present tensions between Albanian Kosovan and Serbian Kosovans become painfully clear. Not only is the city socially and culturally segregated, the river Ibar also physically splits the Serbian and Albanian communities. North Mitrovica, where Serbs form the majority, begins where the black two-headed Albanian eagles disappear and where the three-colored Serbian flags and Serbian Orthodox crosses conquer the streetscape. The realization that our UN bus reached a different part of Kosovo became even clearer when several inhabitants of North Mitrovica made a hand gesture in the direction of the bus, raising three fingers into the air as a sign of Serbian nationalism. The second visit of the day was to the office of the UN High Commissioner of Human Rights (OHCHR). Several interesting presentations by UN staff-members introduced the goals, activities and accomplishments by these amazing people. A subsequent fruitful and interesting Q & A session suddenly became intense when a question by a student triggered one of the (Serbian Kosovan) UN staff-members to share two personal and emotional experiences of Albanian violence against Serbians in the Mitrovica area. The subsequent discussion about guilt, generalization and feelings of safety roughly introduced us to a new reality in Kosovo. The “Serbian perspective” was further illustrated to us during our meeting with several students of the University of Pristina Kosovska Mitrovica (dislocated and disconnected from the University of Pristina after 1999 because of ethnic tensions and language barriers). These Serbian students provided us with a perspective on the “Kosovo issue” that strongly differed of what we had encountered until that moment and that defied our understanding of objectivity and academic neutrality. As the rather nationalists students explained, they will never recognize the country they live in and Mitrovica will only be a part of Serbia if the rest of Kosovo follows. It was not only this nationalistic view that was rather confrontational to most of our students; it also was the rigidity and unwillingness of the Serbian Kosovan students to even consider a different solution. On several occasions, the Serbian students would resort to emotional examples of the Serbians in Mitrovica as victims of Albanian violence and injustice and of the international community. Being a student of a university that promotes critical thinking and objectivity, the emotional and closed views of the students sitting opposite to me defied everything I learned at AUC. On the one hand, the Serbian Kosovan perspective was a wake-up call. During our first three days in Pristina, we mostly looked at the “Kosovo cause” from an Albanian perspective. In Mitrovica, we (or at least I) learned a different, maybe neglected, perspective on Kosovo and the future of Kosovo. Serbian Kosovans generally feel discriminated against and do not feel safe to travel to Albanian territory in Kosovo. On the other hand, the Serbian perspective on Kosovo and on Albanians turned out to be far more rigid than I expected it to be. While Albanian Kosovars in Pristina often expressed to us their willingness to build a common future, the Serbian Kosovars were rather convinced and nationalistic in their views, even though this is not necessarily representative for the general perspective of Serbian Kosovans. While enjoying ice cream at the Mitrovica shopping mall to cool down after our intense experiences, Enver, our amazing host, stated that the Serbian perspectives were not surprising to him. 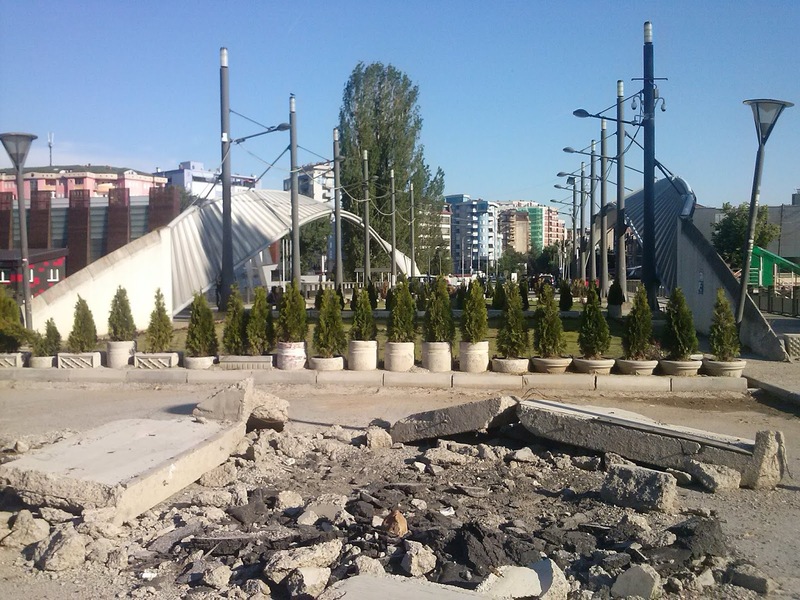 Mitrovica is the Kosovan city where the ethnic tensions and feelings of unsafety on both sides become most apparent. “The bridge” over the river Ibar is barricaded and represents a major physical boundary between North and South Mitrovica and between both communities. Ironically enough, a small patch of flowers and grass, called “Park Mira” (Peace Park), adorns the bridge. However, as Enver explained to me, it only takes a spark and five minutes for ethnic violence to flare up in Mitrovica.